Dr. Martin J. Murphy is chairman and chief executive officer of AlphaMed Consulting that provides strategic support for academic cancer centers and cancer drug development programs of global pharmaceutical and biotechnology companies. As chief executive officer of the CEO Roundtable on Cancer, he is a prominent proponent for cancer research and cancer prevention on the international scene, including China where he is the chief executive of CEO Roundtable on Cancer-CHINA. He is also the founding executive editor of The Oncologist, a global top-tier clinical cancer journal, founding executive editor of both Stem Cells, a journal of stem cell biology; and of the journal Stem Cells Translational Medicine. Dr. Murphy championed the All Ireland Cancer Concord, a bilateral agreement focused on cancer research. For his promotion of cross-border cancer research collaboration by the U.S. National Cancer Institute, Queen’s University Cancer Center in Belfast, and cancer centers in the Republic of Ireland, he was awarded an honorary doctorate from Queen’s University School of Medicine in Belfast, where he is a charter member of the International Advisory Board. 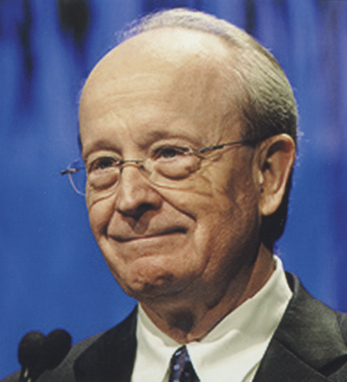 Co-founder of the Society for Translational Oncology, he is a member of the National Cancer Policy Forum, the National Academy of Medicine, the U.S. National Academy of Sciences, a director of the Foundation for the National Institutes of Health, a charter member and director of C-Change, founded by former President George H.W. Bush and former First Lady Barbara Bush, and is a fellow of the American Society of Clinical Oncology. He is married to Dr. Ann Murphy, president of AlphaMed Press. They have five children and 10 grandchildren. In 2003, Taoiseach Bertie Ahern presented Dr. Murphy with his Irish citizenship. His ancestors are from Achill Island, County Mayo.